My first set stopped working after I downloaded a software update so Dean ( The Manager ) sent me a replacement updated set which worked fine. Since then I have purchased a further set and all is well. I'd like to thank these guys for their great customer support and for their integrity. Other Aussie businesses should be more like this. Thanks again for the great products and service. Great price, they work well in my printer, no error messages or incompatibility. Will purchase again for sure. Cartridges were delivered next day by Aust Post, packaged well and left at my door as requested. I have been getting my ink cartridges from Ink Hub for some time now. I have always found that they are great value and delivery times are amazingly fast. A few clicks on the computer and usually next day you have your order. Wouldn't go anywhere else. Great price, free EXPRESS delivery and inks were installed and working in less than 48 hours from the time the order was placed. There was no way in hell that I was going to pay $214-00 for a full set of these HP 955XL cartridges from Officeworks. I would rather have just ditched my printer. I had nothing to lose so I bought a set of these generic ones and they work great. I am so glad that I stumbled across Ink Hub on Google cause I was seriously going to just trash this printer. I will most definitely be coming back for more when these run out. 10 out of 10, as you have probably guessed I'm one very happy customer ! Bargain price and superb service. Received an email to confirm the order, not long after I received the despatch email with a tracking link. The cartridges were delivered the next day to Brisbane. My only gripe is that will these be available to purchase as individual cartridges? Needed these in a hurry, have used Ink Hub before. Product was delivered next day, service was quick, accurate and easy. When will my HP 955XL Value Pack be delivered ? All of our Value Packs are Delivered throughout Australia by EXPRESS Aust Post. All orders placed before 3.00pm Adelaide time will be posted the same day. 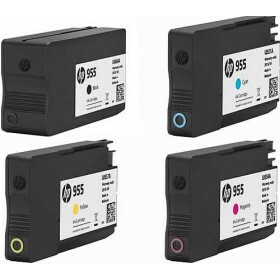 Your HP 955XL Value Pack comes with a 60 Day Money Back Guarantee. Our Guarantee is rock solid! Unlike other online stores selling Generic Cartridges we stand behind all of our products. If you have any issues whatsoever with your products simply call our office and we will sort it out immediately. Our generic cartridges are all brand new NOT refills. Our Guarantee also assures you that you will get the print quality that you expect from a quality cartridge as well as a page yield which exceeds the OEM equivalent page yield. If you are not happy with any of these aspects simply call us for a full refund. Will these generic HP 955XL cartridges give me a good page yield? Will these generic cartridges be fully compatible with my printer? Yes they will, we guarantee that they will work faultlessly and also that they will show the correct ink levels just like the more expensive HP cartridges do.